The New England Patriots have appeared in the National Football League’s annual championship game a record 11 times, winning the Super Bowl six times. 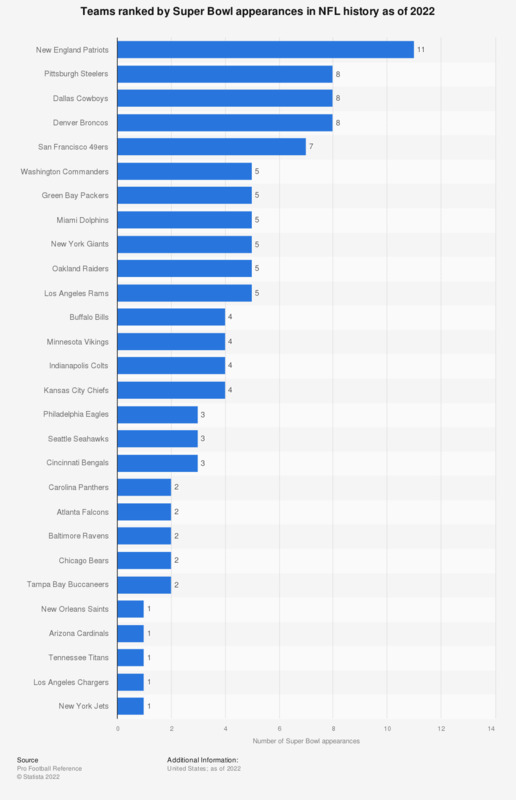 The Patriots and the Pittsburgh Steelers share the honor of winning the Super Bowl the highest number of times (six wins each). All of the Patriots six Super Bowl wins have come with Bill Belichick as the head coach and Tom Brady under center at the quarterback position. Super Bowl Sunday, somewhat considered an unofficial national holiday in the United States, is the biggest single day sports event in the United States. Every year the final game of the NFL season has a domestic TV audience of around 100 million viewers. The game generates several hundred million U.S. dollars in advertising revenue, with average costs of a 30-second TV commercial during the game sitting at around five million U.S. dollars. The impact of the game also shows in the estimated consumer spending related to the Super Bowl, as U.S. consumers spend around 15 billion U.S. dollars on food and beverages, team gear, decorations, TV’s and furniture every year.